PLEIKU, South Viet Nam. Dec 29th (UPI) -- A new wave of U.S. Army infantrymen was flown directly from Hawaii to Viet Nam today, boosting American combat strength to 184,000 men. The reinforcements will be used to counter infiltration from the Communist North. Troops and equipment of the 3d Brigade of the 25th Infantry Division shuttled into a newly-constructed jet airfield in the Vietnamese central highlands. The "Tropic Lightning" Division's motto is "ready to strike -- anywhere, anytime." The first elements of the 4000-man brigade landed in the heart of the mountain region where infiltration is the heaviest. Their arrival appeared to answer Secretary of Defense Robert McNamara's statement on his last visit here that new counter measures were required against greatly increased reinforcements from the North. "Elements of the 3d Brigade of the 25th Infantry Division will be landing at several places in South Viet Nam in the next few days," a U.S. military spokesman said in Saigon. A spokesman at Pleiku said the brigade would eventually consist of three infantry battalions plus artillerymen, engineers, motorized cavalry, and a support battalion. The entire outfit is being flown here direct from Hawaii where the 25th Division is based. The division's other two brigades will remain behind for the present. The air brigade was made up of Big C 183 Cargomasters and the larger C 141 jet transports. The First Air Cavalry Division and the 101st Airborne Brigade already are in action in the mountainous central region, stamping ground of most of the North Vietnamese Army units which have infiltrated South Viet Nam. It has been the scene of the bloodiest American battles. The reinforcements are the first to reach Viet Nam since last October. The American buildup since has been stalled because Viet Nam's ports, docks, and warehouses were incapable of handling the supplies needed for additional troops. U.S. Army Chief of Staff Gen. Harold K. Johnson said today a crash building program at two seaports had filled some supply gaps. The arrival of the brigade seemed to bear this out. Altho the 25th was not officially posted in Viet Nam before, hundreds of its soldiers have fought here in the past three years. All were helicopter machinegunners who rotate from Hawaii. The 3d Brigade of the U.S. Army's 25th Tropic Lightning Division began arriving by C-141 and C-133 transports at Pleiku, 240 miles north of Saigon. They will take over a bivouac area secured by elements of the U.S. 1st Air Cavalry Division as part of the U.S. challenge to six or seven North Vietnamese regiments reported operating in the mountains. SAIGON, South Viet Nam (AP) -- While truce talk pervaded the Vietnamese theater of war today, the United States underscored its commitment to South Viet Nam by airlifting another brigade of U.S. troops into the jungle conflict. The moratorium in the U.S. air war over North Viet Nam went into its sixth day, but the halt in the air attack still drew no public peace feeler from Hanoi. The South Vietnamese government was reported ready to join the Viet Cong in proclaiming a cease-fire for the Vietnamese new year next month. The United States entertained some doubts but was expected to concur in the truce. Neither Washington nor Saigon saw the Communist offer of a truce on Tet, the lunar new year festival Jan. 20-23, as a significant breakthrough toward peace. In the long guerilla war, a military lull during the national holiday has become an annual ritual. 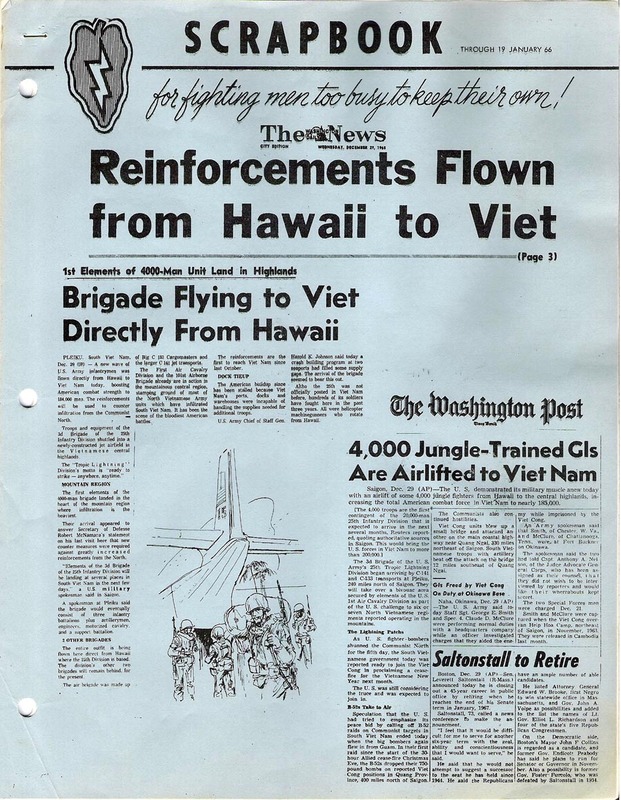 The airlift of some 4,000 jungle fighters from Hawaii to the central highlands base of Pleiku, 204 miles north of Saigon, raises the total American force in Vietnam to 175,000 men. The 3rd Brigade of the U.S. Army's 25th "Tropic Lightning" Division was arriving by C141 and C133 transports to join the American challenge to six or seven regiments North Vietnamese regiments reported operating in the mountains. The brigade is taking over an area through which Communist supplies are believed coming from North Viet Nam. Some of the men served as volunteers in Viet Nam before as machine gunners on helicopters. The division won its nickname and lightning armpatch for its jungle fight against the Japanese in the Solomon Islands in 1943. U.S. officials did not say whether the rest of the division would be moved in from Hawaii.